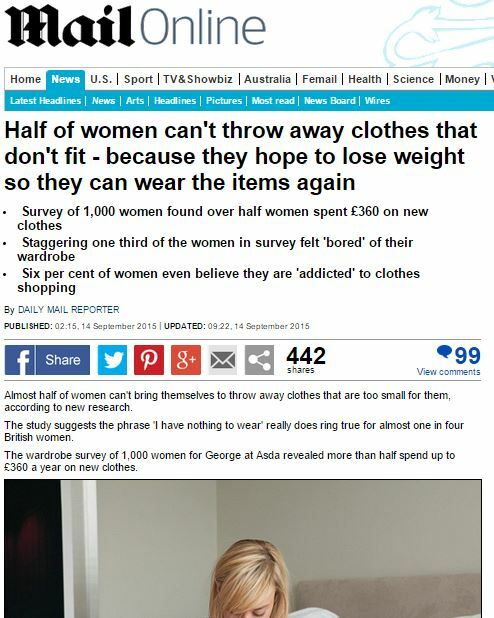 Almost half of women can’t bring themselves to throw away clothes that are too small for them, according to new research. The study suggests the phrase ‘I have nothing to wear’ really does ring true for almost one in four British women. The wardrobe survey of 1,000 women for George at Asda revealed more than half spend up to £360 a year on new clothes. A spokeswoman for George said: ‘What this research has revealed is that clothing bought in smaller sizes accounts for a huge percentage of unworn purchases, so it really is important to buy and dress for your size and shape and feel confident in everything you wear. This entry was posted in ASDA and tagged asda, daily mail, daily mail reporter, george on October 8, 2015 by Michael Marshall.